Give the special ladies in your life an aromatic gift you can make using some of the beauty secrets from Hawaii. The luscious exotic oil, Kukui Nut Oil, comes from the Kukui nut tree and is the official state tree of Hawaii. It was used as lamp oil in early times, as well as being used as a healing oil for burns, skin irritations and wounds. It easily penetrates the skin and hair and contains a high fatty acid content which is necessary for softening the skin and hair. It’s aroma is sweet, pleasant, with a nutty undertone. Due to its moisturizing and regenerative properties, it is extremely beneficial for mature, aging skin as a facial and body oil and used to treat radiation burns from breast cancer radiotherapy. Did you know that Hawaii is the largest producer of macadamia nuts in the world? While these are wonderful to eat and enjoy, Macadamia Nut Oil is highly emollient, has no odor, is suitable for massage, and its fatty acid content closely resembles human sebum. Being a lower priced oil than Kukui Nut Oil, it is widely used in skin care products. 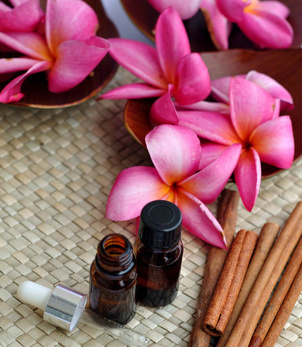 Lavish your entire body with these exotic oils and feel the difference using these Hawaiian beauty tips. ● 12 drops Ylang Ylang Complete ● 8 drops Rose Geranium ● 10 drops Sandalwood. Mix essential oils and add to carrier oils. Massage gently on the face as well as all over the body for a luxurious glow! Chocolate Decadence without the calories! 1½ cups Brown Sugar ● ¼ cup of Kukui Nut or Macadamia Nut Oil ● 6 drops Cocoa Absolute ● 14 drops Tangerine Murcott. Mix all ingredients together and store in tight container. While in shower, rub chocolate scrub onto extremities and torso using small circular motions. Not for the face. Pay attention to dry and rough areas. Let the aromas envelope you. Rinse with warm water. Polishes away dry skin, leaving skin hydrated and silky smooth. This entry was posted in Bathing Rituals, Carrier Oils, General. Bookmark the permalink.